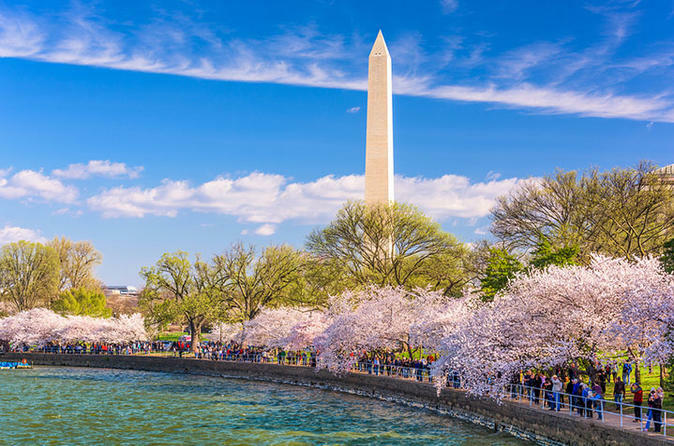 Enjoy a 5-day tour of Washington, DC, our nation's capital during the cherry blossom festival. Your tour includes a visit to Ford's Theater, the WWII Memorial, the FDR Memorial, the National Cemetery, the Holocaust Museum, the National Archives and the National Cathedral. Tour Mount Vernon, the Marine Memorial and the National Cathedral. Enjoy an illumination tour of the monuments; the Jefferson Memorial, Lincoln Memorial, Korean Memorial, the Vietnam Memorial as well as the White House and Capitol. Day 1: Depart New England for Washington DC on Amtrak train. On arrival in DC, join your fellow travelers for your Washington DC Experience. Breakfast and dinner are included. Day 2: Your tour of our nation’s capital includes a visit to Ford’s Theater where Lincoln was shot. Your next stop is the WWII Memorial. This impressive monument is dedicated to those who served in World War II, and is sure to move you. We continue on be the FDR Memorial, located along the tidal basin. When the cherry blossoms are out this is a magnificent view and brings to life the beliefs of Franklin D. Roosevelt. This afternoon we visit Arlington National Cemetery and take a narrated tram ride through the cemetery. On your tour visit the grave sites of JFK and RFK, see the Memorial to the Challenger Explorers, the tomb of the unknown soldiers, and witness the changing of the guard. Our last stop of the afternoon is the National Archives where you can view our countries most important documents. (The lines at the National Archives is often 45 minutes to an hour). Breakfast and Dinner. Day 4: Begin the day with a visit to the National Cathedral. Next it is on to Embassy Row and Georgetown. In the afternoon visit the Newseum, the museum that makes the news come alive. Breakfast and Dinner. Day 5: This morning start the day with one of the most moving museums in Washington, the Holocaust Museum. This museum serves as a reminder of mans inhumanity to man, lest we never forget or allow genocide to continue throughout the world. If you are not interested in the Holocaust Museum you can have the morning to visit any of the other Smithsonian Museums located nearby. In the afternoon you are transferred to the train for the return trip home (extra cost). Breakfast. ** Please note that if you wish to visit the White House you must contact your Congressional office. You must apply in advance for these tickets because of security.